Unless you're co-GMing, you don't really have allies. Therefore, when you are over by 1 or over by 4, you can decide how to distribute those details. When over by 1, simply choose which negative detail to add. Most of the monsters have a weapon like ''Vicious Teeth (as Hand Weapon)'', so when adding a negative detail, smash up their teeth and add a capacity of form [Broken ( /3)]. When over by 4, if there are multiple monsters, distribute the ally detail to another monster, or, get creative and bring another monster into the combat from the shadows at far range. If over by 4 when a player is working with the monsters, have the traitorous player add a detail. If none of that makes sense (for example, when you aren't fighting monsters), have the Child, Mother, or Crone influence the situation and add a related detail. Following the logic of the fiction, when the player is over by 4 but no ally is present or able to participate, have another player add a detail about how the rolling player succeeds. If none of the other players has an idea, have the Child, Mother, or Crone influence the situation and add a related detail. When the player is under on a ranged attack or spell, it can be hard to know what details to add. The monster might move closer by one range step (a scene detail). The monster might change their tactics to avoid further ranged attack (using large trees for cover, hiding behind a door, using a player's character as a human shield, all scene details). The monster might have their attention drawn by this ranged attacker (a soft detail). Simply missing the monster is not an option in TIH, because you're always changing the world and adding a detail. As a general rule, the GM tells the players the detail(s) being added. However, if your players are amenable to it, you can hold a detail in reserve (written, but not divulged) until a suitably dramatic moment. Players can get help from allies, Masters, and aptitudes. Each helping bonus stacks; therefore, the player might be rolling up to 4 dark dice and choosing the best. The only downside is that they have used up all of the help available to them (and possibly imposed upon the Masters). Players are responsible for knowing whether they have helped this scene, and therefore, that they cannot help again. One of the two players wrote down a relationship after the help, so it shouldn't be too hard for one of them to remember. Always have players describe how they help. Don't let them just say ''I help!'' and roll the die. Work with the players to determine the kinds of stories you all want to experience. In preparing for sessions, avoid having a strong idea of the goals that you, as GM, think that the players should accomplish. Instead, look at their Masters to determine the kinds of orders the players might get. Look at your notes and scene details from the last session to see how the world has changed. Move the plans of the evil and corrupting forces in the world forward one step, and show the impact of that step to the players. When prepping the first session, be careful not to answer the character questions. The character questions are a chance for the players to give useful input for the world-building process. After the first session, start to answer some of the questions for classes that were not chosen. One method of describing the world is to have one of the Masters call the player to their domain to answer for some disobedience or get a new assignment. Have the player describe the lands of the Master. The Indie Hack does not have a system by which turns are handed out in combat. Because of the way the GM gets details when the players roll under, it's not essential to have the monsters act in turns. Occasionally, give the monster a turn to do some characteristic action (use a special kind of attack or a spell) and have the players react (see the section called Saving Yourself earlier in the text). When a player helps another successfully, if they were next up, reconsider giving them the turn (don't forget about them entirely, just move them down in your mental ordering by one). The repercussions of not following the orders of the Masters are left vague in the main text. The player might lose the Master's help for a time. The player might next get a menial assignment. The Master might refuse payment or (suspiciously) miscalculate the reward for a task. The player might be sent on a mission that is doomed to fail (is this done intentionally to remove the character?). The character might be assigned a minder, someone to ensure that the character is following the Master's dictates. The Master might order the assassination of a rival. The Master might send assassins after the character. Remember: The Masters strive always to further their own power; if they think that they can get away with something, they'll attempt it. If a rich world of guilds, religions, political parties, and other factions is desired, these organizations can be written as per Masters. Members in good standing can request help (getting an extra Dark Die), information, and suitable supplies. Members who work against the goals of the faction might be admonished, humiliated, shunned, excommunicated, flogged, or sentenced to death. Over time, with the correct tools and raw materials, items can be created at a rate of 1 hard detail per Jingle of cost. At every roll of the dice, the players are enriching the world in ways that get written down (and sometimes, eventually crossed out, but never erased). If there is any competition among players, it should be to have the other players and GM say ''Wow, that's cool!'' when writing details down. When your players are comfortable with the system, start to bounce the details. Be prepared to adapt to the playstyle of your group. In a playtest session, a player wanted to use his shield as a scoop to throw flesh-eating beetles at an enemy. ''Okay, neat! Roll Precise!'' was all that there was to say. When it failed quite badly, the character took a damage detail by dropping many of the beetles on himself. If your players enjoy getting into their backstories, at character creation, have the characters add 4 scars. Later, have a character rub a scar and tell the story of how they got it (preferably while the characters sit around a campfire); then, give the character 1 Milestone (if using) and place a checkmark next to the scar (these stories can only be told once). The characters should feel that they live in a mysterious and deadly world. Narrate interesting and dangerous situations and characters. Make failure fun by embracing it (statistically, you'll fail quite a bit in this game): Adventure wouldn't be adventure if the heroes could easily overcome every obstacle. Have the players converse (or even argue) with The Three Judges when they fall in battle (or fall off a cliff). Characters returning from adventures will be more scarred and wiser (and will not always get the loot that they were expecting). ... 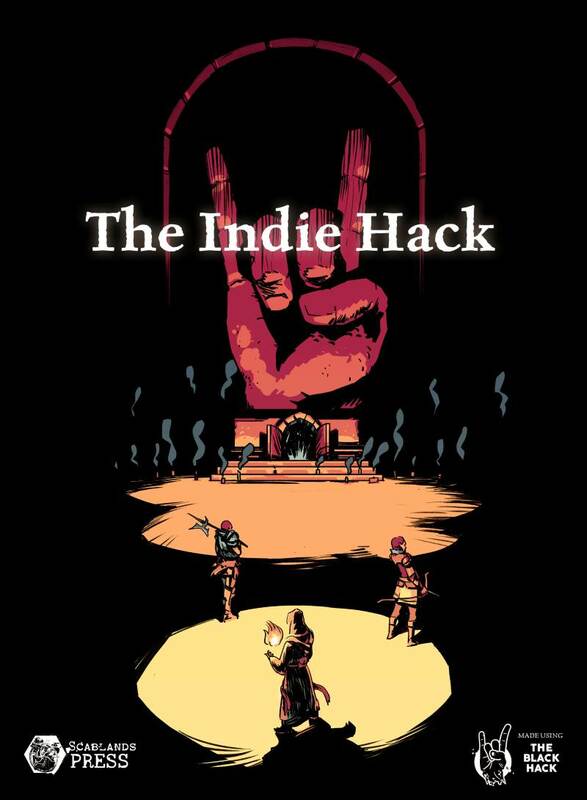 The Indie Hack aims to simulate that classic DnD feel while keeping the flexibility of story games. After my review of Into the Odd, I find myself moving from story games to old-school systems. I couldn't resist when Slade mentioned he was working on a game that combines the two! Similar to Dungeon World, The Indie Hack aims to simulate that classic DnD feel while keeping the flexibility of story games. However, The Indie Hack takes a completely different approach: Details Are Everything. Whenever players interact with anything, they do this by adding/changing details. Hard details are drastic changes, soft details might be minor or temporary, and scene details can affect multiple things in the area. Attacking an enemy allows you to add details like Bleeding, Crippled. Disarmed, and so on. Objects and enemies can only contain so many negative details before they fall. So an enemy might have 5 "health", and after 5 details are added, the creature falls to the ground, broken, bleeding, disarmed, insulted, and confused. The variety of which details are added and how they are added keeps the game simple but engaging. A great choice for anyone who's looking for something with low overhead but high flexibility. Two other mechanics worth mentioning. When you take a long rest, you can turn your injuries into scars, which add some neat flavor to the game. But my other favorite idea is how relationships are handled. When someone tries to help you, you both roll dice. If their dice are better than yours, you accept their help, and your relationship grows stronger. Yay! But if their dice were worse than yours, you reject their assistance, and your relationship grows weaker. I just love the idea of someone trying to help pick a lock, but just gets in the way, frustrating the player who needed help. Brilliant! Character creation and game play are so simple that they will make pick up games a breeze. This time it comes in the form of a simple 2 die RPG. The Indie Hack is a derivation on the quick rule set of The Black Hack. But it takes it ease of play and creativity one step further. For those of you out there who are fans of FATE, this should be fairly familiar. Each item, player, NPC and scene is full of details. Details that simply paint a picture of the world around you and details that change the face of combat or interaction. These details come in 3 different flavors with your choice of Positive or Negative just like a good desktop power supply. Hard Details - Are damage or other things that fundamentally change the face of a situation. Soft Details - Are temporary or superficial changes. Scene Details - Are details that change the world around you and can shape tactics and situations. During combat tests rolls determine who sets new details each round. From adding a chandelier above a sword fight to dropping said chandelier on top of an opponent during the heat of battle. All of this is clearly and simply illustrated in the text and it seems to me to be one of the easier systems to get new players to wrap their heads around. The in game currency is called "Jingle". Much like in Apocalypse World currency is anything with intrinsic or extrinsic worth. Taking the focus off of accounting and moving it to the realm of barter and haggle. Not haggling on a daily basis is a new invention of the bar code age. This system brings back the offer and reply that ran economies ever since strangers meet to exchange this for that. It requires more role playing than simply exchanging gold pieces. Once you have been beaten to death by your favorite monsters. The game doesn't end, but leads you to something akin to the fates. They are called "The Child, The Mother, The Crone" each of them will ask for something in return to sending you back to the realms of the living. Making your very own PC. 7 sample character classes are offered covering your standard fantasy fare. But the classes are so very basic that it shouldn’t take a trained gamer much more than 10 minutes to create their own. The book ends with some advanced rules and advice about how to run a good game and campaign. Using the same rules I have used for decades for advancement of players. The "Why should you level up?" advancement system of bragging and achievement. A few templates for making the monsters you wish to kill your party with, show how easy it is to grab any fantasy monster manual and get down to business. The art in this slim book is fantastic and extraordinarily evocative. It isn't everyday that a book seems to get the art so spot on. But this is one of them that does it very well. After reading and re-reading this. I know that I am not doing the game justice with my review. It is far better written than I could hope to emulate. So if nothing above has made you want to go out and pick up a copy. Let this, go out and get it. Run it and see. It's worth the money.